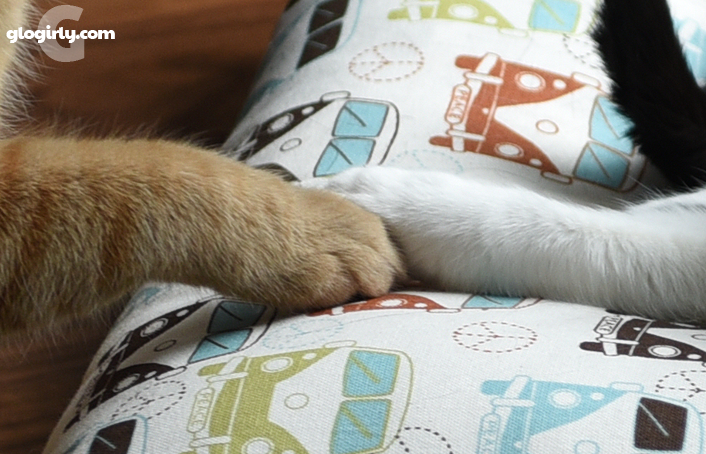 GLOGIRLY: Katie & Waffles Shocker: Holding Paws??? WAFFLES: So Boss. We've been together now for about elebenty seven years. KATIE: Actually, it 2 years, 8 months, 21 days, 6 hours and 11 minutes. WAFFLES: That's what I said. Elebenty seven years. KATIE: Fine. Elebenty whatever. So just how long are you planning on keeping your paw there? Because for the record, mine was here first. And yours is encroaching. WAFFLES: Yeah, Boss. You know. Like going study and stuff. KATIE: You mean going 'steady'? We are NOT going steady, Waffles. WAFFLES: Does that mean we're not going to the first base thing? KATIE: What, you mean like baseball? You should have heard Glogirly squealing after she shot these photos this past weekend. Katie and Waffles HOLDING HANDS??? Waffles is fascinated with Katie. Always has been He SO wants to engage. After breakfast, Katie trotted over to one of her favorite hang out spots - her big soft pillow by the sliding glass doors. It's one of the few spots Waffles usually lets her be. Until Saturday. He walked up to her, sat down just at the edge of her pillow and started meowing. Long, extended meows. Slowly he reached out with his right paw towards her. 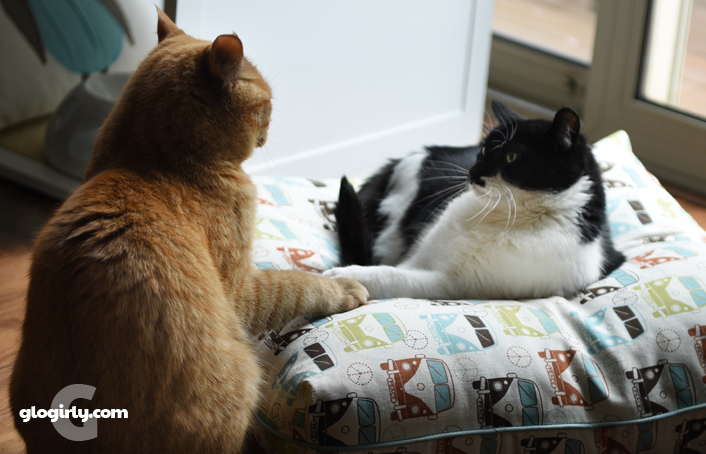 He carefully set it down right on top of her paw and then laid it on the pillow next to hers. Then came the stare down. This was one of those moments Glogirly would pay just about any amount of money to be able to read their minds. These are actual, untouched photographs. NO photoshop trickery was used. For real. I know you wouldn't use trickery. You know we care about Waffles adventures too much! Wow - this is CNN worth alright!! Katie does look quite regal sitting there accepting the attentions of her supplicant. OMC!!! Somebody needs to call Access Kittywood! ha. WE think Waffles needs a KITTEN! First off, I can't believe he's been there for over two years!!!!! Wow, cute paw holding! If it wasn't for the helicopter ears on Waffles it would be so sweet because Katie actually looks almost relaxed there! Almost But wow, amazing progress, I'd be squeeeing too! I want to know what eventually happened? Did he just leave? Were any whaps traded? Was dinner served? 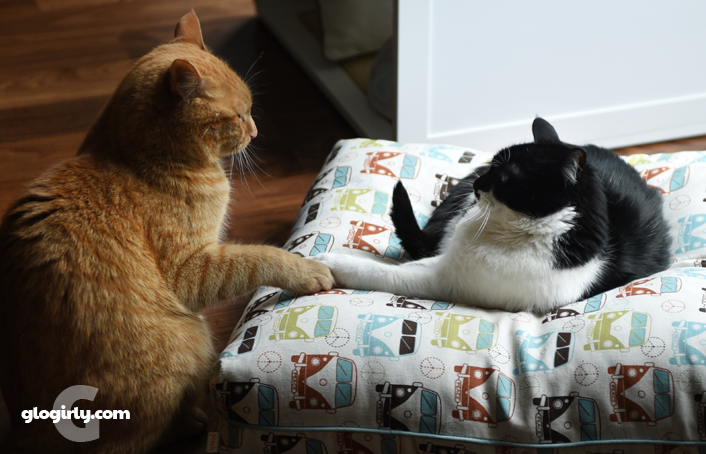 I don't want to burst anyone's bubble (especially Glogirly), I think those paws are there claiming that beautiful pet pillow. But Katie is not moving her paw or swatting her paw at Waffles as anyone would expect so is she holding down her favourite spot or holding her favourite buddy? Wow! Alert all news media!!! LOL "These are actual, untouched photographs. NO photoshop trickery was used. For real." Kitties are funny. And they love to do exactly what you figure they'll never do. "Those to never get along" Annnnd then they're snoozin next to each other. "That one never comes out." And then that one comes walkin out like "...what? I always do this. " Well, we have already seen the kissing pic! Oh, Waffles, it isn't enough to charm have eleventy million girlfriends around the world... you have to try to charm the one tuxie who really prefers a little solitude, don't you? Aww sweet - at least they weren't scratching each other. Maybe one day they will snuggle up together. Wow what wonderful photos even though we had to look more than once as we couldn't believe our eyes! Now if it were not for Waffles' airplane ears, I might think this spelled romance. OMC! We think this pic might be one to hang on to. Amazing!!! Will wonders never cease?????? Oh Katie - explain to Glogirly that the ears say it all. There was an exchange for sure after the camera stopped. You protect your space - I have no doubt. LOL...Yeah..how long was it until Katie smacked him upside the head??? All I can say is...Whoa! Dood! Awww, Waffles. Katie does love you - in her own way! Katie, we thinks Waffles is gonna win you over....one of these days. Baby steps Waffles! Whoa, are those some pigs we see flying overhead??? Nah, he wants to annoy her, so he can nap on the pillow. Oh I DO want to know what happened next!! Don’t waste the moment, Waffle. Propose to her!